This Summer, we are asking Australians to host a BBQ. It is a way for you to reconnect with family and friends and enjoy the warmer weather whilst also raising funds for Soldier On - so throw another snag/prawn/steak/soy alternative on the barbie and enjoy the mental health benefits! Sharing experiences and catching up on what's been happening in our individual and collective lives is an enjoyable way to actively reduce stress and the likelihood of depression and anxiety. Connection to family, friends, community and a meaningful purpose and vocation not only supports our health and wellbeing but also our relationships and economic prosperity. At Soldier On working side by side individuals and families to build connection is at the heart of all our programs and services. Whether its strengthening connections to self and others, connections to the community, or employment - it is the cornerstone of what we do. By hosting a BBQ you will be doing you and your friends a service in strengthening their protective factors against depression and anxiety as well as supporting those, and their families, who put their lives on the line to protect and secure Australia. What an awesome excuse to enjoy some sun, good food and time with friends and family. This vital funding will help us support more service personnel by providing health and wellbeing support, including psychological services, employment training and education services, and social connectedness programs and activities across our network. Get behind those who served Australia by registering to host a BBQ at your work, in your backyard, in your community or as an online virtual event. So you want to host a BBQ?! Start by setting up your fundraising page. Click on the “Start Fundraising” button at the top of this page. If you are a previous fundraiser, enter login details. If you have not logged in before, you can sign up using your email address. Once logged in, click ’start a new campaign’. Name your BBQ e.g. "Company X BBQ" or Your Name BBQ. Fill out the remaining details and submit campaign. Your campaign page will then be created. At this point you can add pictures or a short video. You can also edit your page at any time using your log in details. You will then receive a confirmation SMS with a link which can be shared with your friends and family. For more tips and ideas, download our Host a BBQ fundraising kit. 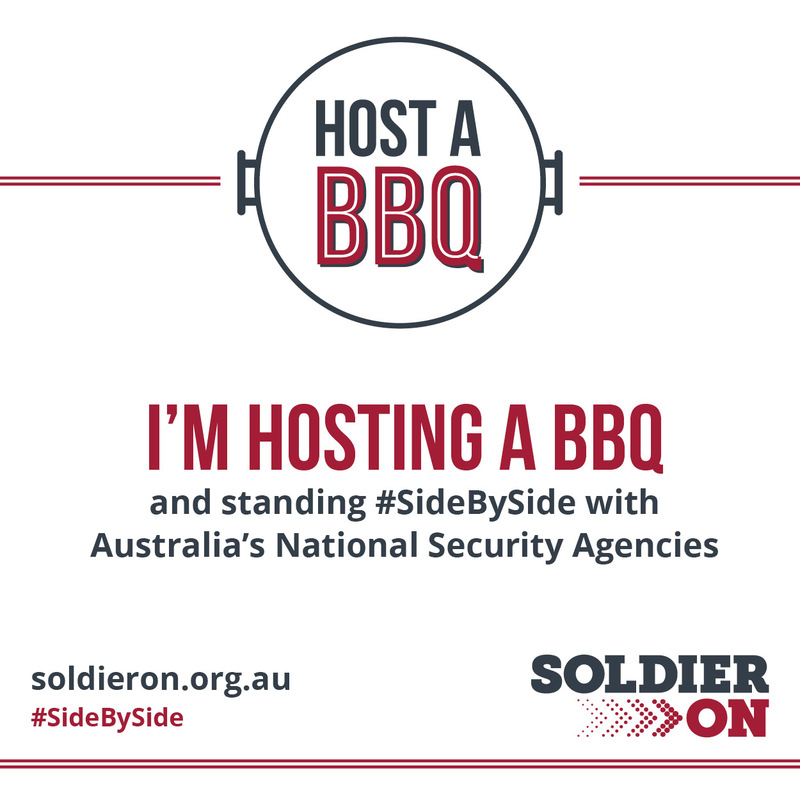 You can also download your free editable Soldier On Host a BBQ poster to promote your BBQ. Download your social media tile here. Download your BBQ Email Signature or Cover Photo here. If you cannot hold a BBQ you can make a donation here. For those wishing to hold a BBQ around Remembrance Day, the video above is available for use. Please email fundraise@soldieron.org.au. Please note that Soldier On does not accept any liability for the BBQs held as part of this campaign. By fundraising, you are helping Soldier On assist those who serve and protect our Nation and their families. Soldier On is focused on helping to secure the futures for all those who have served and continue serving our nation. We recognise that this service goes beyond the ADF uniform and reaches into our National Security Agencies. On 10 October 2017, Soldier On extended our support services to all those service personnel from national security agencies who have served, and continue to serve, side by side with the ADF. This includes individuals, and their families, from Australian Federal Police, Australian Border Force, Department of Foreign Affairs and Trade and other security agencies. Securing and protecting Australia in complex environments, domestically and globally, requires integrated multiagency and multidisciplinary teams of national security agency service personnel to work side by side, both on and offshore, and this should be no different at home. We support those who serve today, tomorrow and into the future.